Cheesecake! 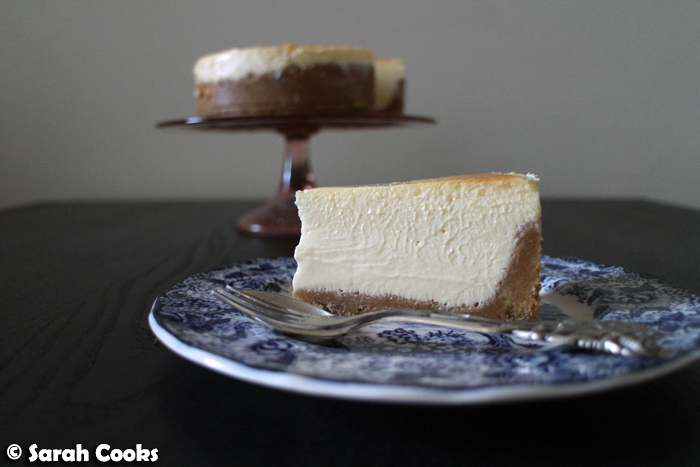 It's one of my favourite desserts, and this particular recipe is my favourite cheesecake recipe, ever! It's Tyler Florence's ultimate cheesecake, minus his blueberry compote. Without the fruit (completely unnecessary, and entirely too healthy, in my opinion), it becomes Sarah's favourite cheesecake. I've been making this for 12 years, and whilst I have dabbled with other cheesecakes (Nigella's London cheesecake, her chocolate cheesecake, her no-bake cherry cheesecake and her old-fashioned cheesecake, to name a few), none have been as simple and perfect as this one right here. The crisp biscuit base, the rich, creamy, vanilla-and-lemon scented filling. Delicious! This is the only cheesecake recipe I need. You may remember I've blogged about this previously - when I made it as an impromptu dessert for a New Year's Eve party - but when I made it last week, I felt it deserved another blog post, with some nicer photos and, crucially, the actual recipe, all converted into metric! I make this cake reasonably often, and every single time I find myself googling Tyler's original recipe, and then thinking: "A pint of sour cream? What the heck is that? ", and "How many Digestive biscuits do I need to buy to make 2 cups?" The answer is 233 grams! In my recipe below, I rounded it up to 250 grams, because a little extra biscuit is always a good idea. McVitie's Digestives because they're my favourite, and I don't think I've ever actually seen a graham cracker here. The biscuit crumbs are mixed with melted butter and a little cinnamon, which gives it a wonderfully comforting aroma. You'll also see I lined the base of my springform tin with baking paper. 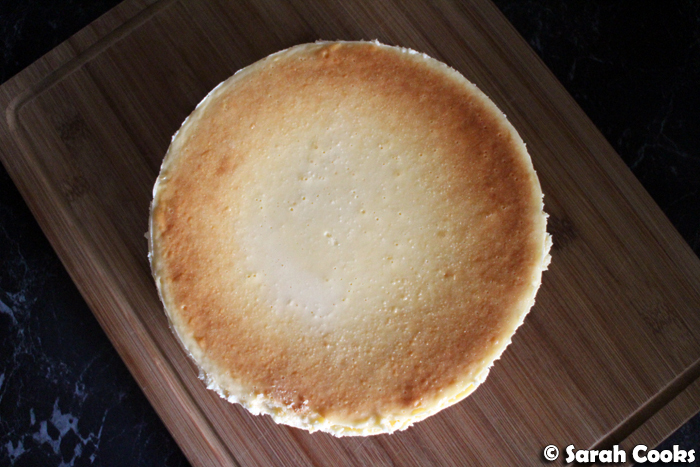 I'm not sure if this is strictly necessary (the crumb mixture is very buttery), but I figure that the paper makes the finished cheesecake easier to lift out, and means less chance of scratching my non-stick baking tin. The crumb mixture only comes halfway up the sides of the tin, but that's ok. Make it neat if you have the time and patience! Even if it's messy it will still taste good. Then you let the base set in the fridge while you make the filling. 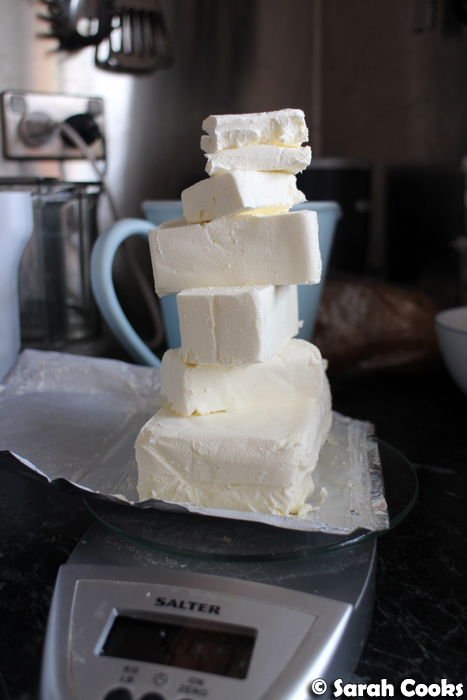 Check out my Jenga-stack of cream cheese! The original, American, recipe calls for a pound of cream cheese (i.e. 454 grams), but here in Australia, cream cheese comes in blocks of 250 grams. I'm fairly sure you'd be fine if you just decided to use two entire blocks, so there's no waste. However, I tend to stick to the original amount - I have digital scales and I'm not afraid to use them! (I also like having cream cheese on toast, so I'm happy to have a small piece in the fridge). The filling is easy to make - just cream cheese (make sure it's soft so that it combines smoothly into the rest of the ingredients), eggs, sugar, lemon zest, vanilla and sour cream, beaten until smooth. 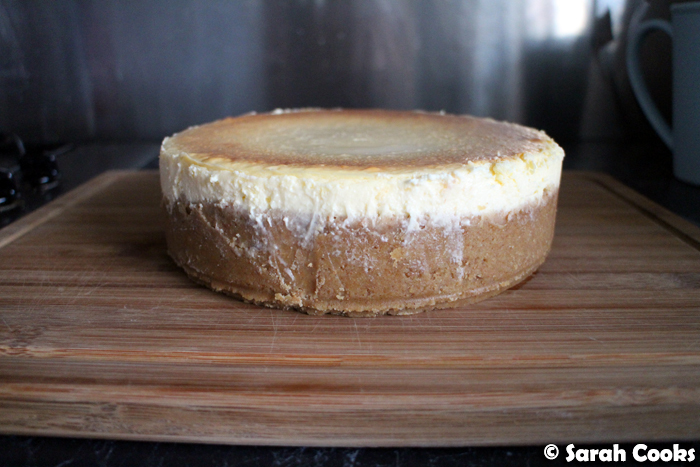 ...the whole shebang is put into the oven, and hot water from a recently boiled kettle is poured into the tray to come halfway up the sides of the cheesecake tin. Once it's baked, you remove the cheesecake from the waterbath and let it cool in the tin, before carefully peeling off the foil and clingfilm, and chilling it in the fridge overnight. Other times that I've baked this, I've cut into it without chilling, (you just need to let it cool until it's firm enough to slice) but it is even nicer once it has had that overnight chill. It goes from jelly-like and moussey, to beautifully dense and creamy. The reason I baked it this time was to say thank-you to a colleague for doing me a favour (it wasn't a huge favour, but seriously, any excuse to whip out a cheesecake!) This particular colleague inexplicably doesn't like sweets, but seems to think my cheesecake is pretty special. I hope you enjoy baking and eating it as much as I do! Preheat the oven to 160C. Butter the base and sides of a 20 cm springform pan, and line the base with baking paper. 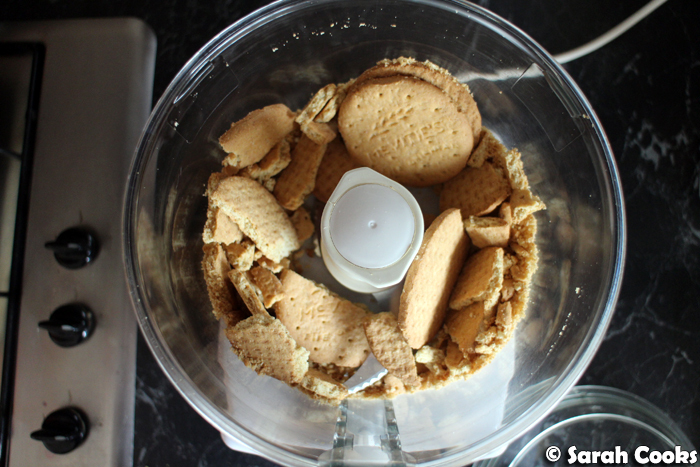 Crush the digestive biscuits to a fine crumb in a processor or blender. 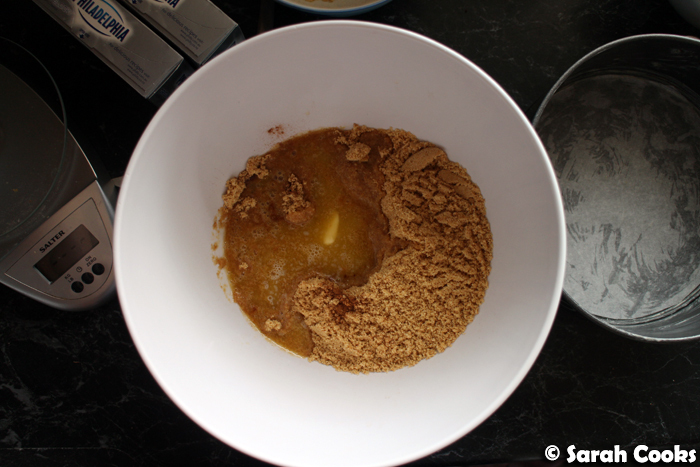 Add the butter and cinnamon and mix to combine. 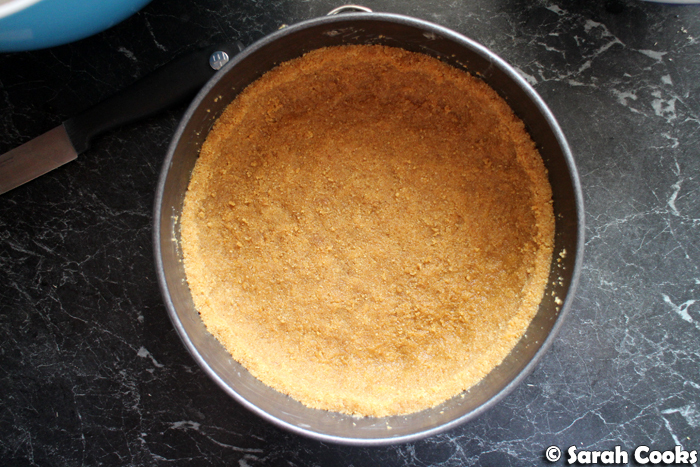 Pour the crumb mixture into the pan, and press evenly across the base and halfway up the sides of the tin. Place in the fridge while you make the filling. Using a stand mixer, or a (clean) food processor, beat the cream cheese until smooth. Add the eggs, one at a time, until well combined. Add the sugar and beat to combine. Add the lemon zest, vanilla extract and sour cream, and beat until smooth and combined. Remove the springform tin from the fridge. Wrap around the outside of the tin with a double layer of clingfilm and a double layer of foil. 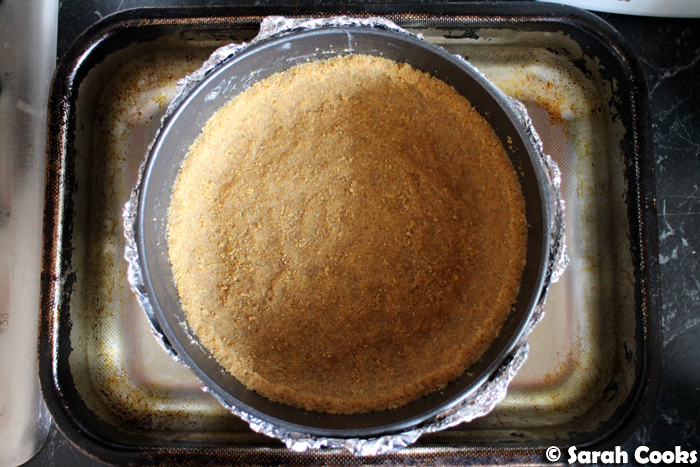 Place the tin in a large roasting tray and pour the cheesecake filling into the tin. 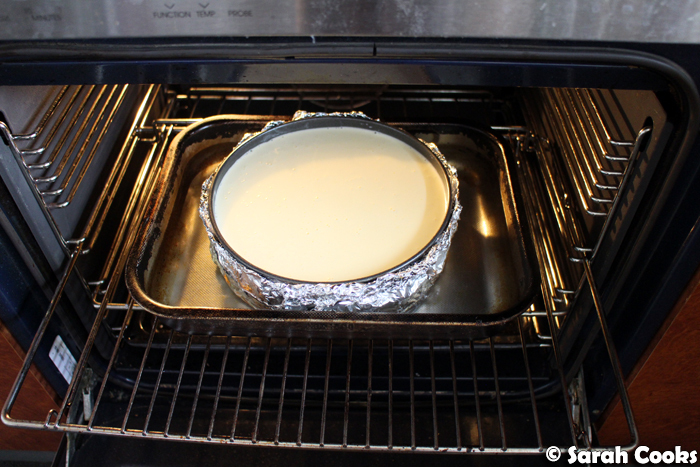 Pour boiling water into the roasting tray to come halfway up the sides of the cheesecake tin. Gently place the cheesecake and roasting tray into the oven, and bake for 1 hour to 1 hour and 20 minutes, or until still jiggly but no longer liquid. 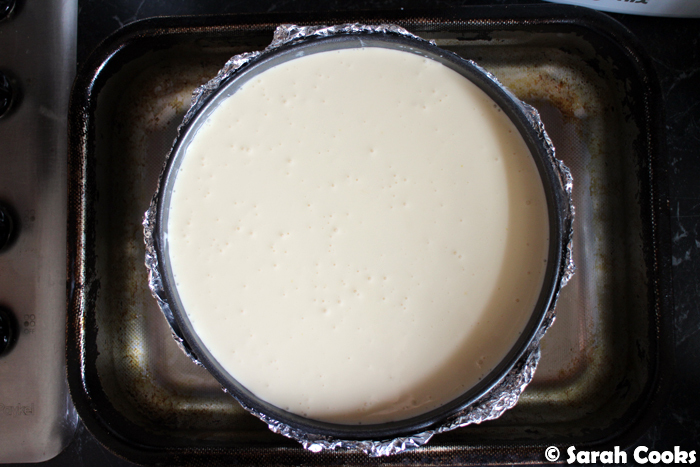 Remove the cheesecake from the water bath, and allow to cool in the tin. Place in the fridge, loosely covered, overnight. 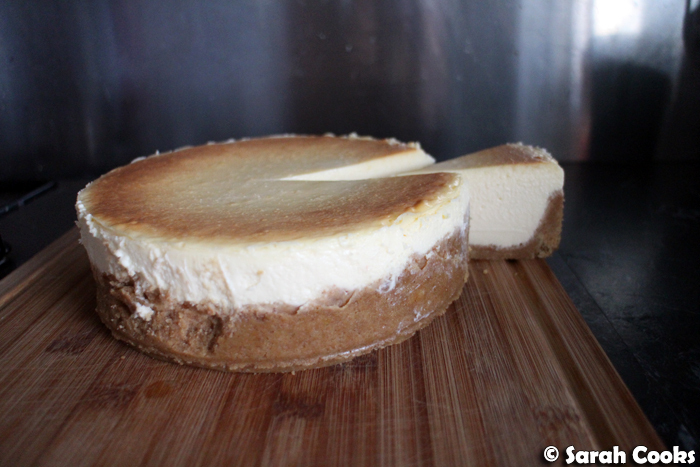 Unmould the cheesecake and transfer to a cake plate. Slice with a sharp knife that has been dipped in hot water, wiping dry between each cut. I can see why this cheesecake is your favourite. It looks incredible! I understand why this cheesecake is your favorite in particular. I think it will be one of my favorites too. Cheesecakes are the best!